The Choose your own insanity gamebooks! 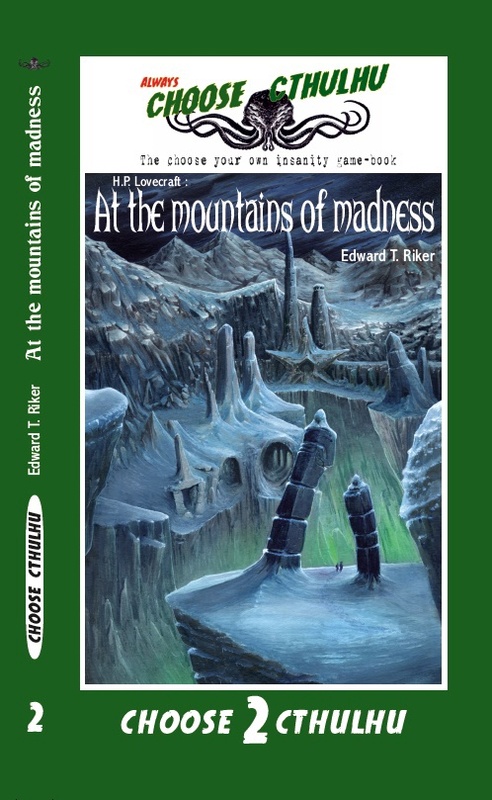 Enjoy the cosmic horror of the Cthulhu Mythos and the nostalgia of the classic gamebooks of the 80s! Towards the end of the 70s, and mostly during the decade of the 80s, a literary phenomenon that would change how we understood reading took place: the gamebook era. Simple stories written in the second-person point of view, making the reader the protagonist, offered us the possibility of choosing between different paths and ways of solving problems that emerged from the narrative. 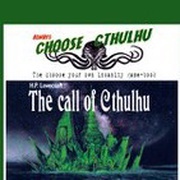 Choose Cthulhu are not new adventures that are "based on Lovecraft's work"... In our books, you’ll come to face the very stories told by Providence’s master! Thus, we have adapted (so far) six of his best stories. Face alien deities that ruled the Earth before man, who conspire to reclaim what was once theirs; horrible monsters lurking in every corner of time; shameful cults… THE ENTIRE MAGNITUDE OF THE COSMIC HORROR! 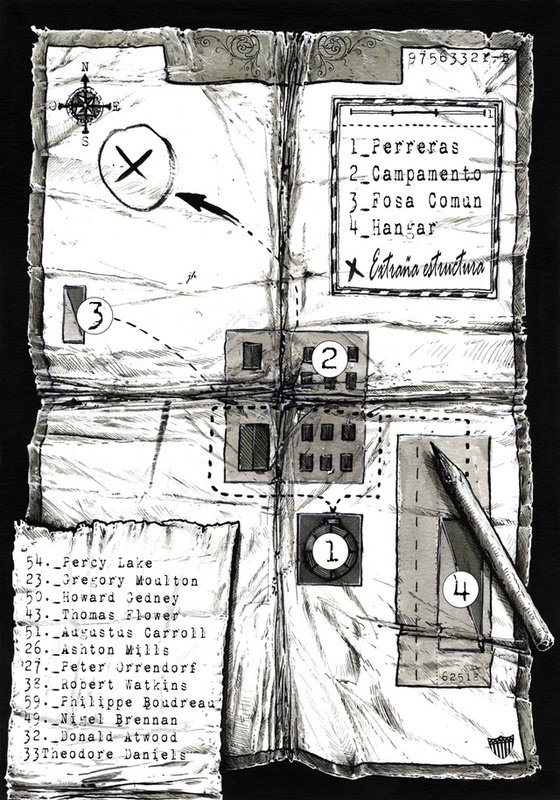 THE ARKHAM MADHOUSE (2017), co-written by Víctor Conde, Giny Valrís and Edward T. Riker. We'll tell you more about it below. 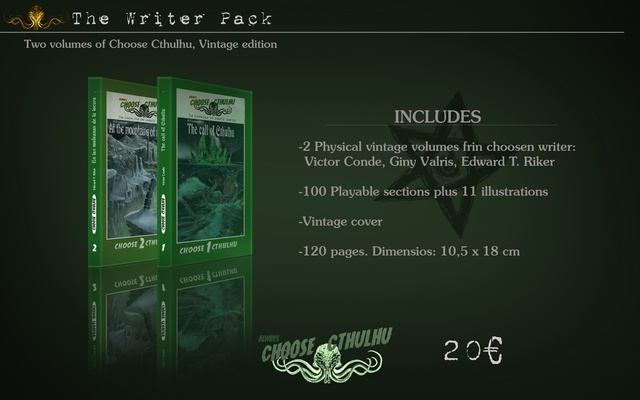 Choose Cthulhu: The Choose Your Own Insanity Gamebooks is a collection of 7 gamebooks in two different formats –vintage and deluxe— that will be available both in English and Spanish. Remember that the seventh book can only be purchased if you buy the entire collection, and that the purchase of the collection entails a discount with which you will get the seventh book almost for free. 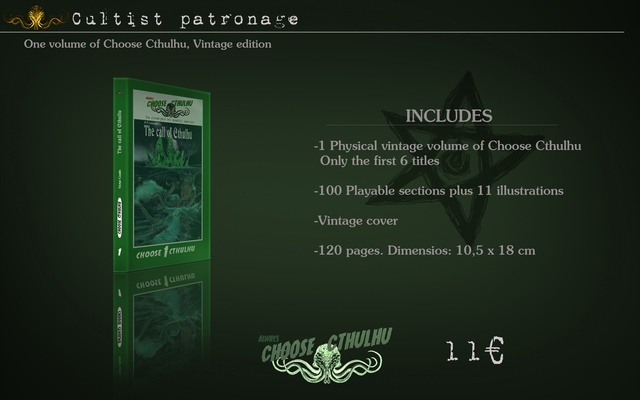 Trying to bring back the nostalgia that the classic gamebooks from the 80's inspires, the vintage Choose Cthulhu collection is completely faithful to the layout design and dimensions of the ORIGINAL Choose Your Own Adventure. Some of the most significant features of this format are the font and the lack of intentionally blank pages and flaps, just as they were released back then. We have changed the white paper used in the originals for ivory-colored paper, which recreates that nostalgia better, and which allows higher ink saturation with high opacity. 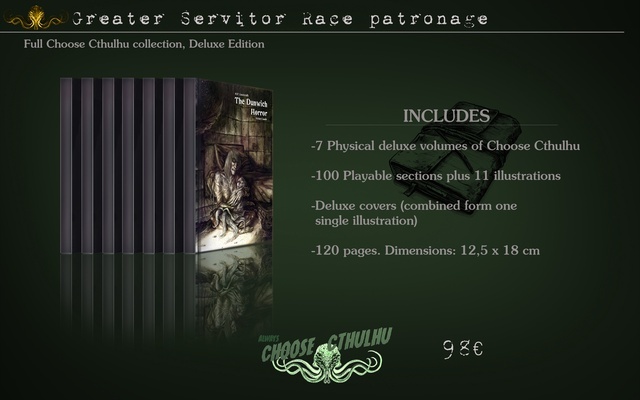 Therefore, the Deluxe edition presents a bigger format and is more complete, adding a bestiary. 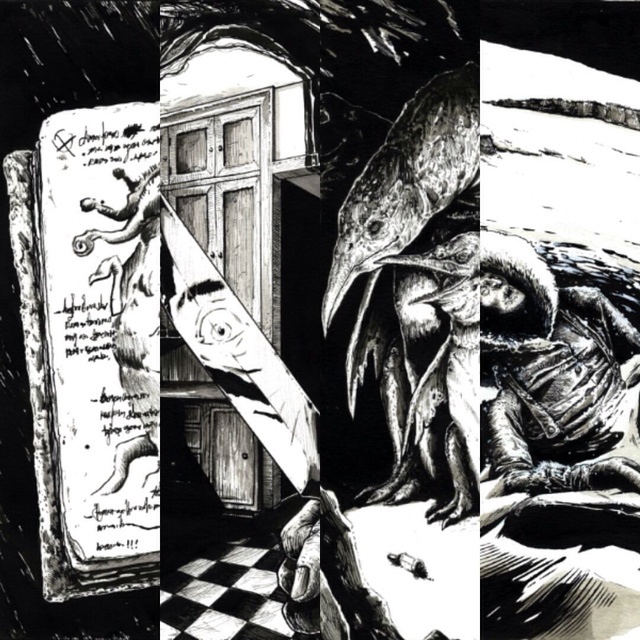 Another interesting feature of the DELUXE collection is that, when combined, the seven covers create a unique illustration closely related to the seventh book, exclusive to this crowdfunding campaign: THE ARKHAM MADHOUSE. The visual aspect of gamebooks gained importance as more and more collections were being edited. Our visual inspiration for this project was the Fighting Fantasy collection. A series with incredibly well-crafted covers and inner illustrations that could drown the reader in the exciting adventures written by our authors. 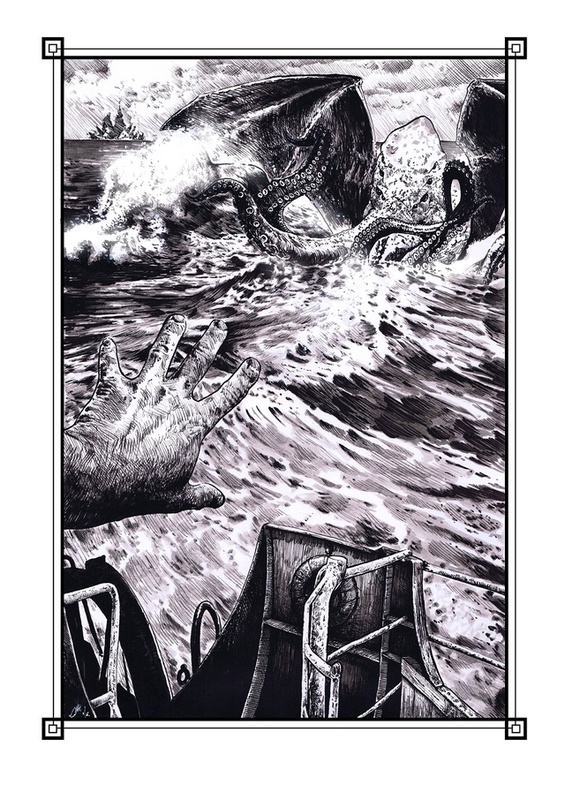 Choose Cthulhu has 11 full-page illustrations in each volume, and many other smaller illustrations to set the scene and endings. 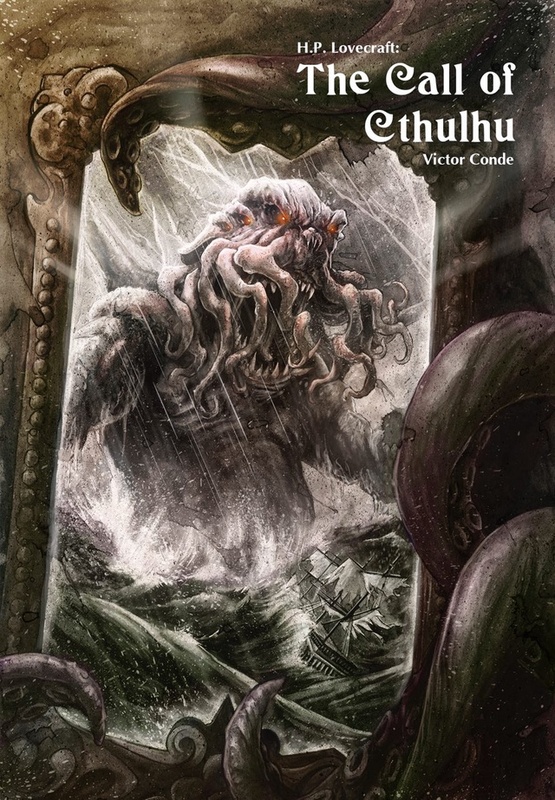 But Choose Cthulhu is also interactive, so we have had to adapt many parts of the text to an easier and lighter reading that allows for re-readings to explore all options without it becoming tedious. We want to warn you that we have used many terms and expressions of the original texts, so there may be some passages that sound weird and outdated. But we also have removed some words that could be offensive nowadays. The answer is YES and NO. We have chosen the classic gamebook format, where there is no dice rolling, nor characters with special abilities; but we have included some simple mechanics in certain volumes in order to make them more entertaining. Some of these are: puzzles you can only resolve by investigating different sections, and the possibility of winning or losing CULTIST POINTS (to end up being the bad guy) as well as SANITY POINTS in THE ARKHAM MADHOUSE. When playing our adventures, a recurring ending is your confinement in cell 77 at the Arkham Madhouse, a terrible psychiatric institution where inexplicable events take place. In this exclusive volume, we reveal to you what happened to all those characters that ended up in the ARKHAM MADHOUSE. With stores and gaming clubs in mind, we have decided to release a number of packs that you can get at a discount when buying multiple copies. If you own a store and want to be the first to stock up on our products, including the seventh book–which won’t be released for regular distribution—, don’t hesitate to contact us at [email protected] and ask about the perks we offer and the possibility of including the logo of your organisation in our Pnakotic Manuscripts. 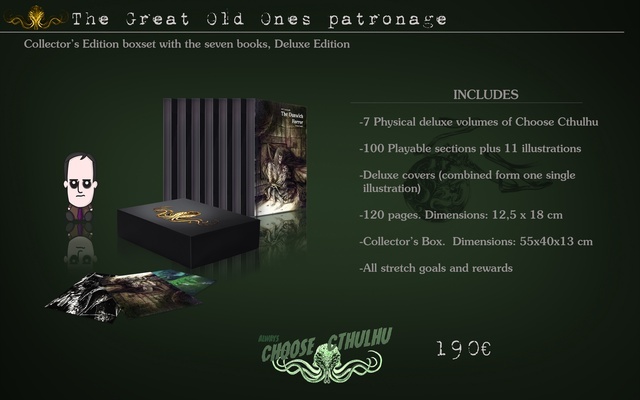 In order to make Choose Cthulhu an even more attractive and appealing project, we have included a number of extras that you can purchase individually, as add-ons, or as a part of our collector’s edition packs. In addition, if we manage to exceed our initial funding goal (€10.000), we have designed a series of STRETCH GOALS. Stretch goals are not an official part of the crowdfunding campaign. They will be added as we meet our goals. Fundraising is not subjected to stretch goals. 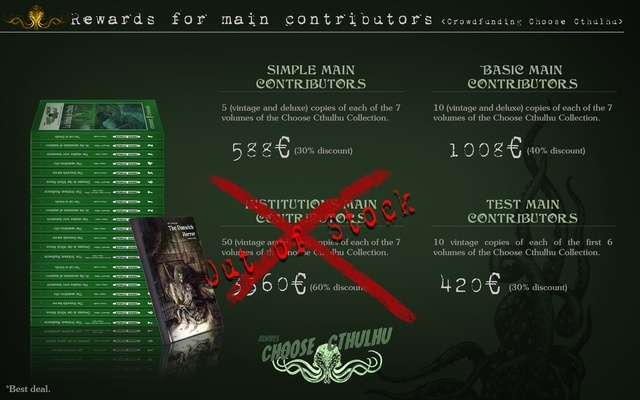 There are SOCIAL STRETCH GOALS where, with your help, we’ll spread the word about the project to try and make more people hear about Choose Cthulhu and participate. It’s as easy as this: if we manage to hit a certain number of retweets on THIS TWEET, and of shares on THIS FACEBOOK POST, we’ll unlock the corresponding rewards for free. We just need to persuade our circles to help us out and, the more we are, the easier it’ll be. Then we have the classic, TARGET-ORIENTED STRETCH GOALS. Remember that you’ll get these products for free once we raise enough money to produce them (along with everything else) keeping the quality of every item. FIRST STRETCH GOAL ACCOMPLISHED!!! BESTIARY FOR VINTAGE EDITION AND ILLUSTRATED BESTIARY FOR DELUXE EDITION ADDED TO THE BOOKS. SECOND STRETCH GOAL ACCOMPLISHED!!! GREAT OLD ONES ENGRAVING BY ELIEZER MAYOR. THIRD STRETCH GOAL ACCOMPLISHED!!! 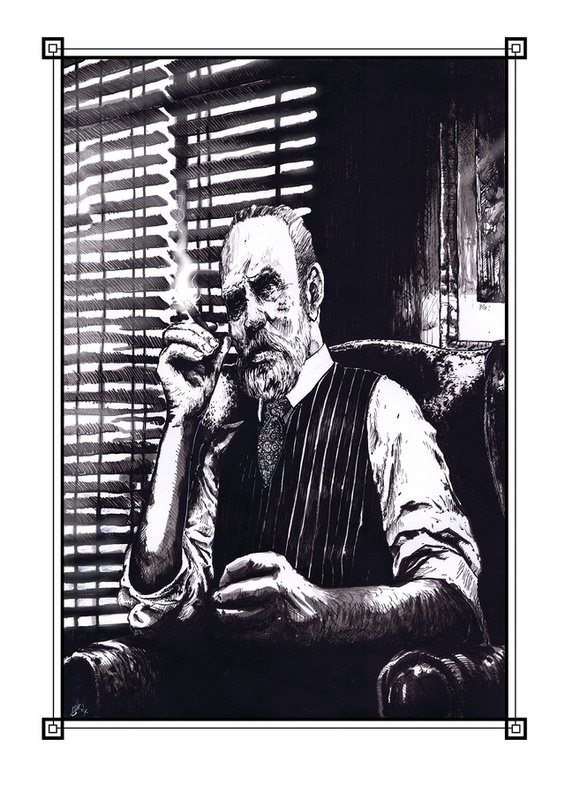 THE ART OF CHOOSE CTHULHU a illustrated book with sketches, plot lines, unused covers and inner illustrations... and lot of interviews with the writers and illustrators from Choose Cthulhu project! Design based on an original jacket of the 30s, one size: XL. 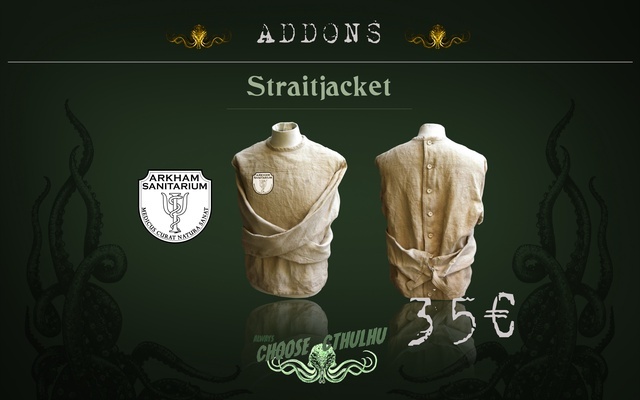 Includes a removable patch with the logo of the Arkham Sanitarium with your name and patient number. 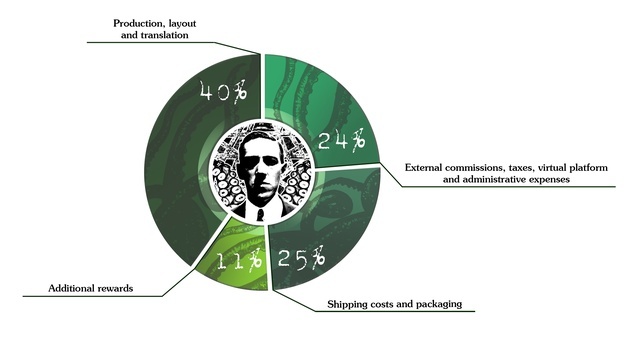 In Choose Cthulhu we want our readers and cultists to face no horrors when it comes to shipping costs. Therefore, shipping is included in the price of the books. 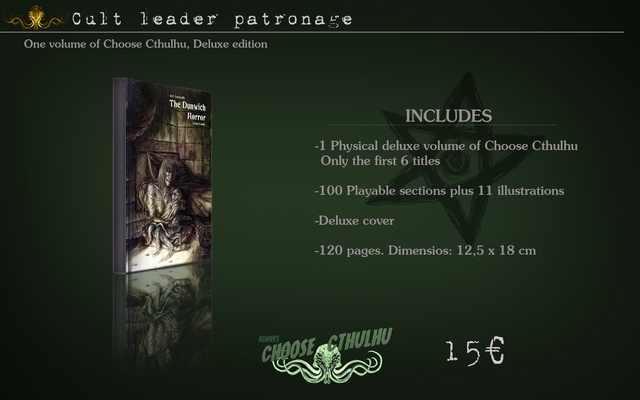 Choose Cthulhu buyers will not pay shipping costs since these are included in the price of each volume or pack, but are responsible for other costs, such as local taxes. For special boxed packs, add-ons and other types of deliveries, shipping costs will be detailed for each country. In crowdfunding projects, one of the main concerns for contributors is knowing that the target amount is in accordance with its cost. There’s nothing more counterproductive for an author than to use their followers to obtain benefits that should come after the first financing. We need 10.000+ euros to finance 14 books (7 deluxe and 7 vintage) in two languages. A number that is not at all unreasonable, even if the content of both editions is similar. The largest investment will go towards the translation, in which we will spend more than 30% of the total funds raised. 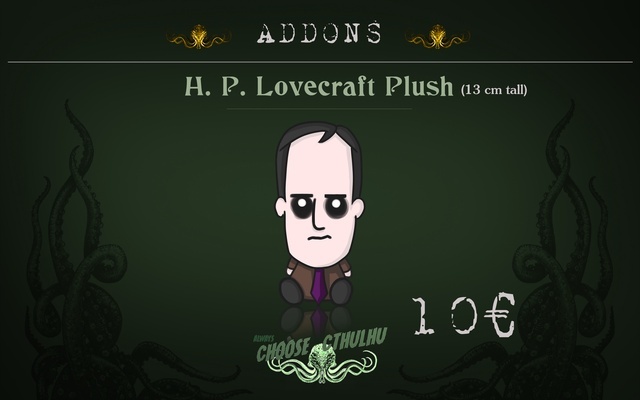 Choose Cthulhu team has been working for two years to reach this point. Everything that was within our reach has been studied and projected carefully and thoroughly, so that when we launched the project to obtain financing, it wouldn’t be a mere theoretical idea. 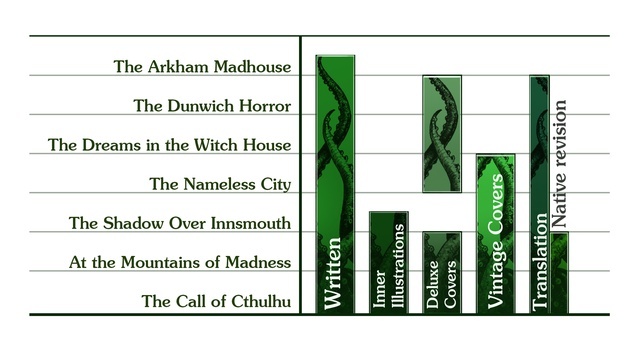 Absolutely every book of the Choose Cthulhu project is now written, the illustrations are outlined, the covers have been designed, and the elements that will be part of the crowdfunding, have all been agreed upon. However, our capacity to work without funds has reached its limit. This is the current status of the project, on January 13. It is crucial for us that the final result of the collection is excellent, and to do so, we won’t hesitate to give it all our time and effort to meet the deadline so you can all hold your books by end of MAY 2018. Víctor Conde has written over ten gamebooks (some of which have been published in China and different European and Latin American countries), as well as over thirty fantasy novels. He has won most of the greatest awards for fantasy writing in Spain, such as the international Minotauro, the Kelvin and the Ignotus awards. Giny Valrís is a YA, fantasy and science-fiction author. Alongside Josué Ramos, she coordinated the anothology Chikara: El Poder De La Naturaleza. 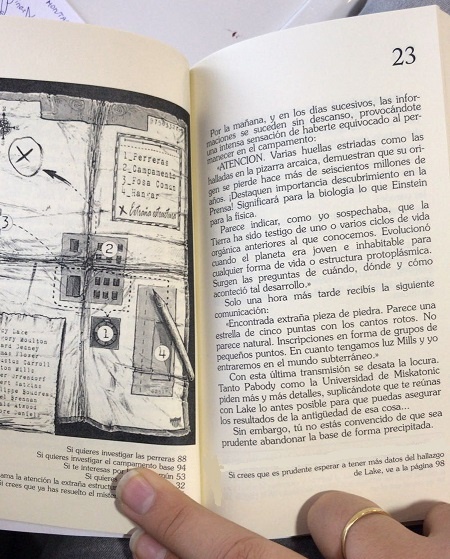 She also put together Los Cuentos de Vaho, a series of anthologies that pay homage to popular tales and H. P. Lovecraft. 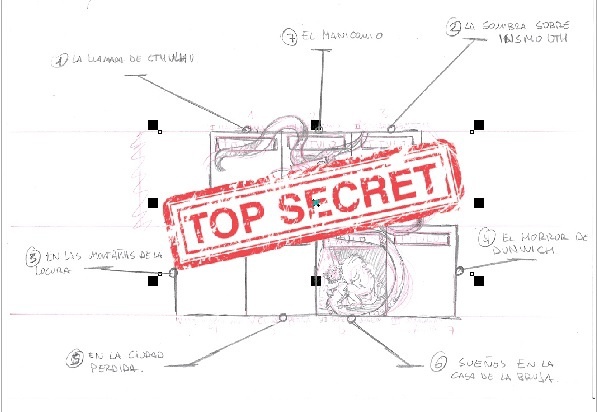 Currently, she’s studying to become an infant and primary teacher, while collaborating with the Choose Cthulhu project. Bachelor in Law. His literary career started at a very young age, when he stood out for his writing of fan-fiction and diverse dissemination articles concerning fantasy and sci-fi, published periodically in different specialized formats and media. He found his passion for art from a very young age. Self-taught, he satisfied his artistic curiosity –especially illustration— before attending Fernando Estévez (School of Arts and Crafts in Santa Cruz, Tenerife), where he learned new techniques and specialized in Engraving and Classic Printing. Afterwards, he got his craftsman card in Engraving and Printing, granted by the Island Council of Tenerife. After five years studying illustration at C10 Creative Workshops and EDSIP (School of Professional Drawing), his career kicked off by winning multiple awards across different comic and illustration contests. He currently designs and creates book covers and illustrates their pages, and his specialty is art with coffee. 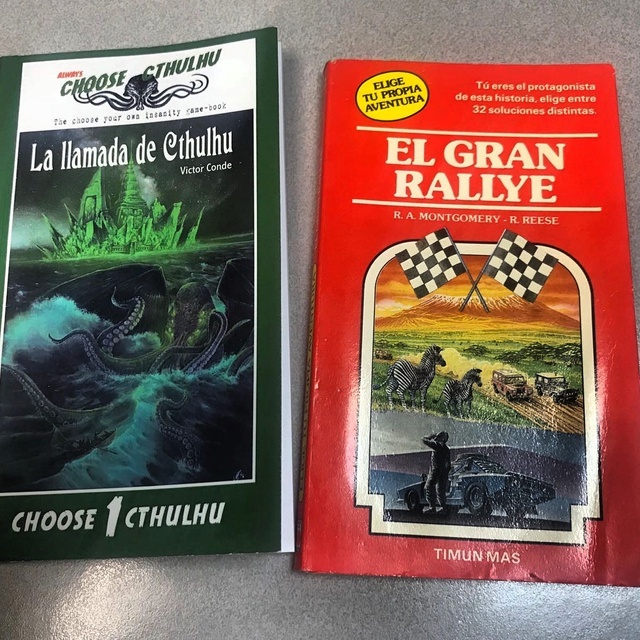 Among his published works you can find El Legado De Christie, a zombie story; and En Las Garras De Bába Yagá, a gamebook for youngsters published by Alfasur edition. In 2016, the publishing house Apache Libros releases his art-book titled Juapi, 20 Años De Garabatos, and Retratos Para No Dormir, where some of his most recent works with coffee are compiled. In 2017 he started working for Corner4art, an international art gallery with more than 20 years of professional trajectory. She has been awarded many literary prizes, completed an internship at a publishing house, and has worked as a translator from and to English on many occasions. 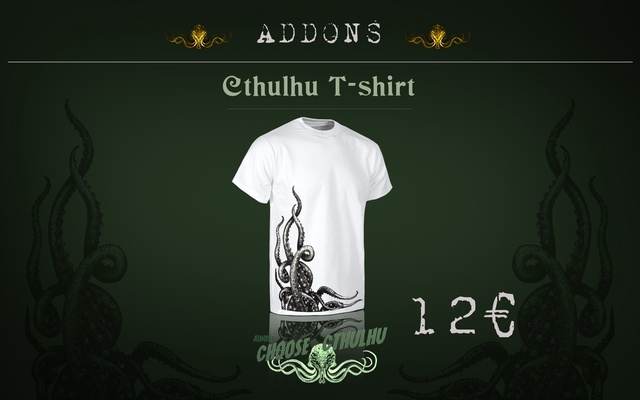 Buenas, no tengo claro como añadir los addons, he cogido la recompensa Early Birds Razas Servidoras menores pero también quiero hacerme con la camiseta, pero no se como añadirla. ¿Podeís indicarme? Gracias de antemano. Te comento: tienes que adquirir la donación de razas servidoras menores primero y una vez lo tengas cumplimentado , vuelves al proyecto y pulsas el add-on! Ten en cuenta que los gastos de envio son gratis para los libros pero los add-ons tienen un coste de 4€ adicionales porque no entran en el acuerdo de nuestro proveedor de forwarding. Espero que esta respuesta te ayude! I want to be at the acknowledgments! 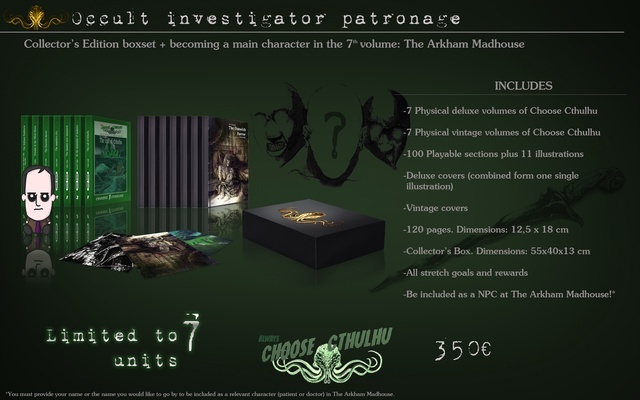 If you do not want any reward, but you would like to contribute with any amount and appear in "The Pnakotic Manuscripts" as a patron ... well, may Cthulhu bless you! 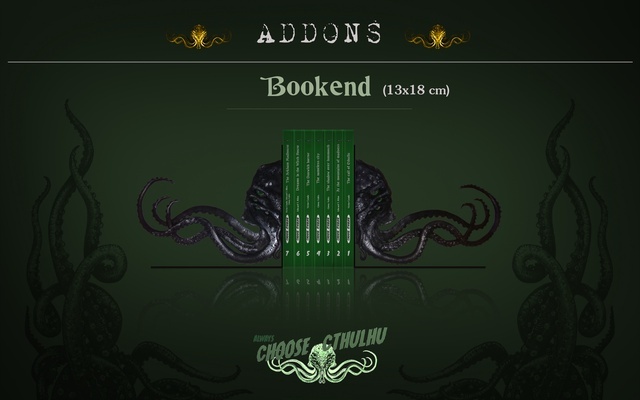 Add-on: Rewards that complement the book collection. Please, choose also one of the rewards that include the book. 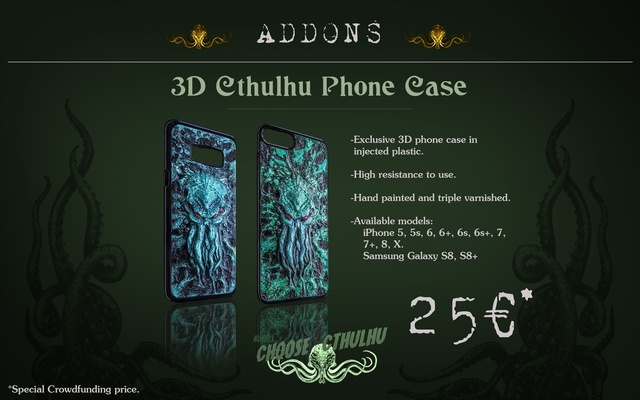 ADD-ON: 3D Cthulhu Phone Case *crowdfunding special deal! Exclusive 3D case made by injection moulding. Hand painted and three layers of varnish. + All add-ons and possible stretch goals. 1 DELUXE (Hardcover, full-page illustration, bestiary) AND 1 VINTAGE (80s style, paperback) COLLECTIONS. 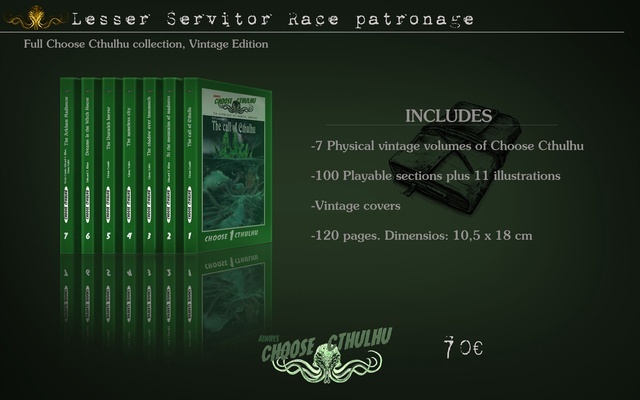 14 physical copies of CHOOSE CTHULHU VOLUMES I-VII.